Following Him is my greatest joy! I pray that I will stay on the path He has for me. Thank you so much for dropping by and your wonderful comment. Encouragement like this is what makes me want to continue to write for Him. 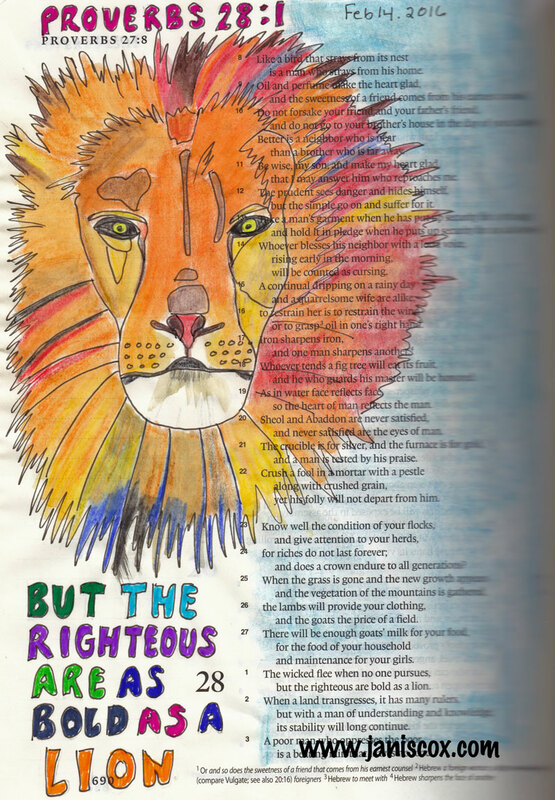 I journaled, took notes and doodled my way through the whole Bible in my leather ESV single column journaling Bible last year and I find that it engaged me with the Word in a whole new and delightful way. I really miss it, but don’t feel the same freedom when I write or doodle in a regular journal, and can’t rationalize buying a new journaling Bible every year. Did you use up all the pages in the journalling Bible? I believe if God touches you in a mighty way with something think about continuing it. You could use a sketch book instead too. Are you on Facebook? I see I am following you on Twitter but you haven’t followed back. I have a Facebook group where we share our work. I would love you to share yours. I love the artwork that you share each week. It really does bring the scriptures to life. Wishing you a blessed week. Thanks again for being so encouraging. I do remember these scriptures more and more as I draw them. Isn’t it interesting what God can bring to our attention when we “simply” look at His word carefully and thoroughly, Janis! And I also love how you take your thoughts and further solidify them by painting or drawing what God inspires from your reading. Lovely! Thanks so much for sharing and for the linkup, my friend! I am really enjoying both looking into the Word and then seeing where God leads me in my painting and expressing. Thanks again. I enjoyed your post today! And yes, He will give us grace and strength to “Be as bold as a lion.” Thank you for the reminder. Blessings to you! Thanks so much for dropping by and leaving a comment. May we try to be bold even though sometimes it feels awkward. Trusting for grace to be bold as He is bold! Oh I love that Michele. Yes I love the story of Aslan and Narnia. And yes not tame for sure. Let’s strive this week to act bold – yet remember His grace in all situations. I love the lion! Thank you so much for featuring my post. What an honor! You are welcome, Mary. It is a great post. Thanks for the words of encouragement. I just love doing this. Can you tell?